Sorry about waiting so long to post the conclusion of this "Winter Worm Farming" series. It's winter and, well, we've been busy taking care of the worms! As luck (of the bad variety) would have it, the coldest weather of the season is coming. Not just the season. The coldest weather in several years. We've been talking about raising worms in the winter. Well, now's a good time to wrap things up. When I left off, I had just walked in on my first "worm nightmare". The worms were a'crawling. The worms were a'dying. What a mess. First of all, I started gathering up living worms and returning them to bedding as fast as I could. Worms cannot live for very long in the open air and uncovered. They would continue to crawl even after being rescued, but hopefully I could get some heat on and settle them down eventually. Any dead worms I put into a bucket for disposal. If you've never smelled dead worms, count yourself lucky. The smell is just awful. So far, because of the cold temperatures, there was no decomposition. Yet. It wouldn't be long, though. Summer is when that particular nightmare generally happens and I'll save it for another day. Can't wait, can you? Luckily, the worms must not have been out for very long because I was able to rescue a large number. The worms that had balled up were in the best shape. By forming a close ball, the worms protect themselves from loosing moisture. The fortunate ones were in the middle. The outside ones were in the worst shape. The single worms suffered the most. Even if they were still alive, they probably wouldn't make it because of dehydration. Sometimes, if they've been out too long, the damage is too great and they can't make a comeback. The ones that don't make it will either be consumed by the other worms, or continue to crawl aimlessly on the top of the bedding and die there. These worms should always be removed to avoid attracting mites. I set out to find ways to prevent future cold weather "worm crawl" disasters. Researching and picking the brains of "old-timers", I learned a few things about cold weather worm farming. Have bedding in outdoor beds deep enough to provide insulation. Colder zones require indoor worm beds. Of course, those of you in colder zones face the most challenges from cold weather. But it is possible to grow worms most anywhere. Be prepared to provide protection for your worms during the coldest months. Your worms can survive, they just need a little help. Avoid mistakes and benefit from someone else's experiences. 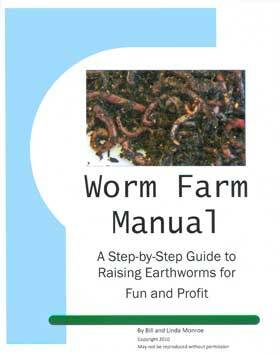 Find more worm farming how-to's and trouble shooting tips in my Worm Farm Manual.